This coming 11 February is International Day of Women and Girls in Science and to celebrate we’re featuring some of the incredible scientists and staff involved in the scientific field across the Queensland Museum Network. Their hard work and excellent contributions often help inspire women and young girls who are interested in following a path in science. We delve into why they chose to get involved in science and what they’ve found most rewarding. I work with preserved crabs, prawns, lobsters and other amazing creatures from around Australia, and I get to see the incredible diversity and beauty of life every day. I also help members of the public identify crustaceans they find (often on the beach or the reef), and it’s fantastic to see what people discover. I feel like I learn something new every day! As an added bonus, for Halloween I get to dress up and show off our ‘creepiest’ looking specimens! It is really rewarding to create experiences that support visitor learning, hearing people share their memories, stories and connections with the Museum and the Sciencentre, and seeing how much it means to them, especially those who later go on to study or be involved with science. At age 9 I asked for a Chemistry set for Christmas. That’s when my love of litmus paper and the test tubes began. Many years later, combining my interest in fossils and my love of test tubes and laboratories, I find myself Senior Fossil Preparator at Queensland Museum. The most rewarding part of working in the fossil scientific community is the discovery of new sites and new species which add to fossil record of Australia and ultimately to the fossil record of the planet. The best part of my job as a Collection Manager is that I get to help a wide range of people, from scientists to artists, to conduct fascinating (sometimes bizarre) research regarding insects, our collections and the people that contribute to them. I learn something new every day. The most rewarding part of my role is using our collections and research to develop resources that inspire and excite students, teachers and the community about science! I became an entomologist and evolutionary biologist because I am fascinated by the interaction between the incredible beauty and unbelievable diversity of insects, and our attempts to mathematically estimate the relationships between species based on morphology and genetics. I chose to get involved in science because of my fascination with the natural world, especially our unique fossil fauna and how they can help us better understand the present and impacts or future environmental change. I got into science because although there is too much to discover in one lifetime, I was certainly determined to try! I got hooked at around eight years old by reading a book on dinosaurs – the joy of finding the right mentor led me into vertebrate palaeontology in my twenties. Five decades on I still get excited knowing I am the first person to see a new fossil specimen, and sometimes have the joy of identifying and naming it for posterity. I became a biologist (evolutionary geneticist) to better understand the world I live in and to use that knowledge to help save threatened and endangered species. The most rewarding aspect of my work in vertebrate palaeontology is working out new information about very old things (300 to 400 million year old fossils) to help our understanding of how the earliest back-boned animals with jaws are related to each other. I originally got into science because I loved that I could ask lots of questions and go find the answers by getting my hands dirty and exploring the natural world. I’m super proud of now leading the Lifelong Learning team, and seeing all of the ways that my team create and facilitate those life-changing, enlightening, inspiring moments with people on all different themes and stories within the Museum. Making new discoveries is the most rewarding part of science. Being the first to know something is really exciting. I chose to get involved in science because it’s great to be at the forefront of discoveries and I love to be a role model for my daughters. I chose science when I held a real human brain in my hands and realised that this was a person, that 1.5kgs was everything that made someone them, and there’s nothing more rewarding then seeing the look on a child’s face when they understand something new and exciting about science. I was the child that always asked why and I chose to pursue a career in science as it provided the answers. I have always been fascinated by the huge variety of animals, the adaptations to their environment and how they interact with it and each other. I am in my dream job helping people understand and appreciate the complexity and awesomeness of the natural environment around them. Follow us on Facebook, Instagram and Twitter to stay up to date on our latest events where you can meet our curators and experts. Kronosaurus queenslandicus was the largest predatory reptile to swim the seas of western Queensland 105 million years ago. This icon of the paleontological world is thought to have grown up to 11 metres in length, with around two metres of that dedicated to its unusually large skull, containing a mammoth set of jaws and dozens of enormous teeth. Recently, an opportunity arose for the Queensland Museum to add to the State Collection with the acquisition of two lower jaw pieces from a large individual Kronosaurus. Although the Kronosaurus is an iconic animal, surprisingly little is known about its biology, with skulls and jaws a relatively rare find. Kronosaurus queenslandicus was named in 1924 by Queensland Museum palaeontologist and former museum Director, Heber Longman, based on a piece of jawbone that was discovered near Hughenden, in central Queensland. It was named after the Greek Titan Kronos; so horrible that he ate his own children. Kronosaurus is a pliosaur, an extinct short-necked marine reptile. Its powerful jaws – which worked in a similar way to a crocodile’s – contain rows of large conical teeth, the biggest of which are nearly 30 centimetres long. Kronosaurus was a fierce predator – remains of its stomach contents found in central western Queensland indicate that it fed on turtles and other long-necked marine reptiles. Kronosaurus fossils have been found in the sediments deposited by the inland seas and turned to rock, ranging in age from 112-100 Million years, during the Early Cretaceous Period. This particular specimen was found by a private collector near Boulia in western Queensland and, through negotiations with Dr Andrew Rozefelds, Head of Geosciences, Queensland Museum, was acquired through generous Queensland Museum Foundation donations directed towards object acquisition. The jaw adds to the Queensland Museum’s collection of Kronosaurus specimens. The acquisition of the specimen will ensure that this important piece of Queensland’s geoheritage is preserved in the State Collection for perpetuity. Importantly, it will also provide an opportunity for both researchers and the broader community to get up close to this fascinating specimen. But as is the case with most specimens of this nature, the jaw was not in perfect condition, which meant that certain work needed to be done before the object could be properly studied, displayed and stored safely within the collection. The main goal for the Geosciences team was to cradle the pieces of fossil as best possible, whilst demonstrating the aspects of the jaw that were missing, especially its teeth. Senior Technical Officer, Ms Debra Lewis took on this meticulous and detailed work. To present the jaw in a life-like pose whilst also safeguarding it from damage, Debra began work on a bespoke base that would serve the dual purpose of supporting the specimen whilst allowing it to be displayed. Debra said that creating such a base is a lengthy process due to how customised it needs to be. As the teeth and part of the bone were missing, careful work was done to demonstrate this as accurately as possible. The teeth were made using 3-D modelling and printing – technology that Dr Scott Hocknull, Senior Curator, Geosciences, has developed within Queensland Museum and has become a key feature of his research and engagement work. “In this case, the benefits of this technology served as a huge time saver,” said Scott. The usual method for producing replicas is creating a plasticine sculpture and using that to make a mould and then cast from it. In this case, the process would need to be repeated for each individual tooth – all 16 of them – which Debra and Scott estimate could have taken a month of work or more. The same result using 3-D modelling and printing took about 36 hours, with most of this made up of printing time rather than manual labour. This is achieved through digitally modelling one tooth, then digitally sculpting a 3-D model of each of the 16 teeth. Using photographs of the original tooth, a 3-D model of it was created, which can then be modified and printed out. Debra then hand painted each tooth in a colour that matched the remaining bone. The final piece of the puzzle was to come up with a way that the teeth could be displayed so that it was obvious to viewers which part was original fossil and which was a reconstruction. “Part of the bone was missing, so rather than replicating this on top of the original, we decided to use clear perspex rods to place the teeth at the correct height and show the position of the teeth as they would have been in the jaw,” said Debra. This was done by gluing each newly made replica tooth to a clear rod and placing it into a small indentation drilled into the matrix (a build-up of rock where the tooth would have sat) so that the rod would fit snugly and can easily be removed and replaced. So where to from here for our “revamped” Kronosaurus jaw? The Geosciences team hope that the specimen will go on display, possibly within the permanent Lost Creatures exhibition at Queensland Museum, where it can be enjoyed by visitors. It is currently available to researchers and is being studied by a PhD student, who has been 3-D scanning the pieces of the jaw to reconstruct the animal digitally and learn more about its palaeobiology. Of course, a scientist’s work is never truly done – there is always more to learn and new examples of these extinct species to be unearthed, which in turn will bring new opportunities for research and discovery. “We’ve known about the enigmatic Kronosaurus for a long time – hopefully we can continue to find out more about this icon of the Cretaceous inland sea,” said Scott. 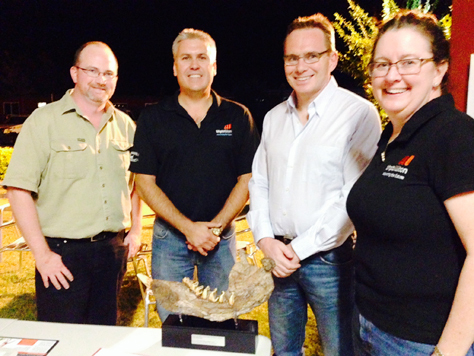 Scott Hocknull (far left), Senior Curator, Vertebrate Palaeontologist was recently invited by BHP Billiton Mitsui Coal (BMC) to speak at an employee engagement event its mine site in central Queensland. For the past 10 months, we have been working on the upcoming Lost Creatures exhibition.